During his visit to Hong Kong in July this year, President Xi affirmed the support of the Central Authorities for Hong Kong to make full use of its role and strengths in advancing the Belt and Road Initiative. 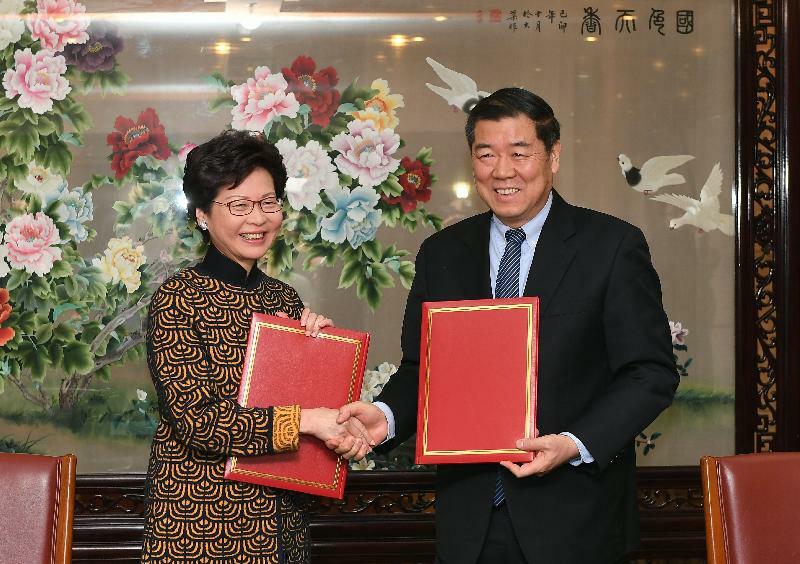 At the request of the Chief Executive, the Central Authorities have agreed in principle that an arrangement on advancing Hong Kong's full participation in the Belt and Road Initiative between the HKSAR Government and the Central Authorities be made. 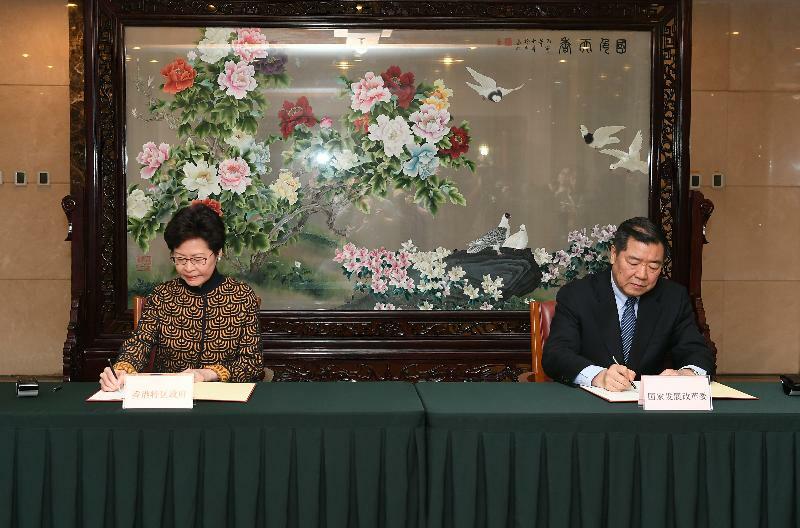 The Chief Executive, Mrs Carrie Lam, signed the Arrangement between the National Development and Reform Commission (NDRC) and the Government of the Hong Kong Special Administrative Region for Advancing Hong Kong’s Full Participation in and Contribution to the Belt and Road Initiative (the Arrangement) with the Chairman of the NDRC, Mr He Lifeng, in Beijing today (December 14). The Arrangement serves as a blueprint for Hong Kong's further participation in the Belt and Road Initiative. The Arrangement will put forward specific measures focusing on six key areas, namely finance and investment; infrastructure and maritime services; economic and trade facilitation; people-to-people bonds; taking forward the Guangdong-Hong Kong-Macao Bay Area Development; and enhancing collaboration in project interfacing and dispute resolution services. Implementation of the Arrangement will allow Hong Kong to give full play to its unique advantages under "one country, two systems" to contribute to the country on the one hand, while at the same time seize those opportunities brought by the Initiative to provide new impetus for its economic growth. "Grounded on Hong Kong's strengths in finance, infrastructure, economic and trade, professional services and more, the Arrangement seeks to enhance communication and co-operation with the Mainland in the 'five areas of connectivity', i.e. policy co-ordination, facilities connectivity, unimpeded trade, financial integration and people-to-people bond. The relevant measures help reinforce and elevate Hong Kong's position as international financial, transportation and trade centres, promote partnership between the Mainland and Hong Kong enterprises, spawn the demand for Hong Kong's professional services, and present our talent with opportune prospects," Mrs Lam said. She pointed out that the Arrangement covers a wide range of areas, which include facilitating co-operation of all key stakeholders through the platform of Hong Kong to provide for the Belt and Road Initiative the funds required as well as a diversity of financing channels; fully leveraging Hong Kong's status as the global offshore Renminbi business hub to facilitate cross-border investment; developing green finance; supporting Hong Kong in providing diversified professional services for Belt and Road infrastructure projects; supporting Hong Kong's maritime development and providing international legal and dispute resolution services for the Belt and Road Initiative; encouraging enterprises in the Mainland and in related countries and regions to establish their regional headquarters in Hong Kong; enhancing academic, cultural and arts exchanges between Hong Kong and related countries and regions; and encouraging Hong Kong to develop tourism products and stage conferences and exhibitions on the Belt and Road Initiative. In addition, a Joint Conference mechanism will be set up between the HKSAR Government, and the NDRC, the Hong Kong and Macao Affairs Office of the State Council and other relevant Mainland authorities for regular and direct communication. The Joint Conference will discuss matters relating to Hong Kong's participation in and contribution to the Belt and Road Initiative and consider specific work priorities. "I would like to extend my sincere gratitude to the Central Authorities for their support and to the NDRC for its valuable efforts made in preparing the Arrangement in the past few months. After the signing of the Arrangement, the Commerce and Economic Development Bureau will follow up with the NDRC on the establishment of the Joint Conference mechanism. 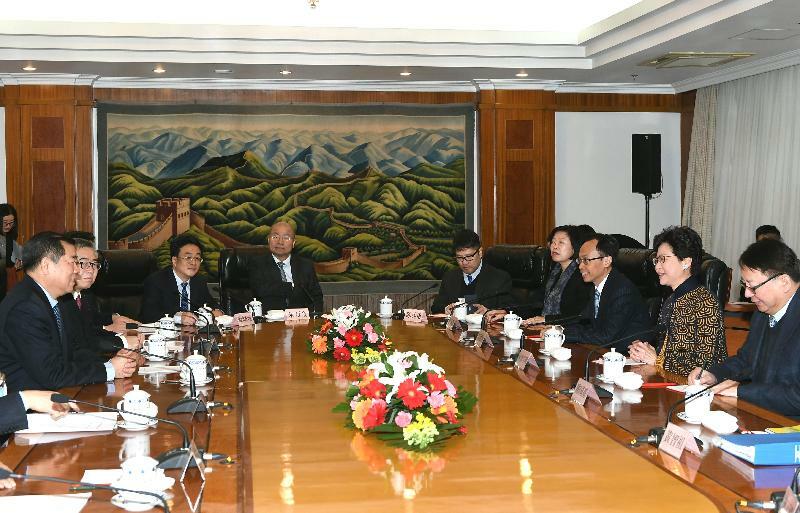 We intend to convene the meeting at the earliest opportunity next year to take forward the various areas of work in the Arrangement," Mrs Lam said. 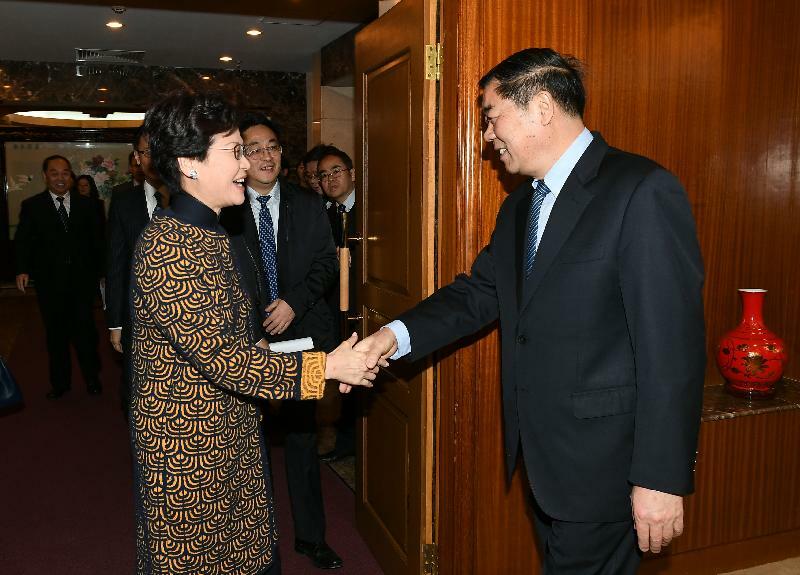 Mrs Lam had a brief meeting with the Chairman of NDRC, Mr He Lifeng, before the signing ceremony, at which he was apprised of the positive responses from the various sectors of the community regarding Hong Kong's participation in the Belt and Road Initiative as well as the Guangdong-Hong Kong-Macao Bay Area. Mrs Lam expressed the hope that the Development Plan for the Guangdong-Hong Kong-Macao Bay Area, which is being jointly drawn up by the three governments and the NDRC, can be completed as soon as practicable to enable the HKSAR Government to take forward the development projects concerned.